Just before Christmas puzzles arrived of my design "Chimney Smoke and Cheery Snowfolk". They've made the design round and it's available in 500 piece or 300 pieces. I'm giving away one of each. 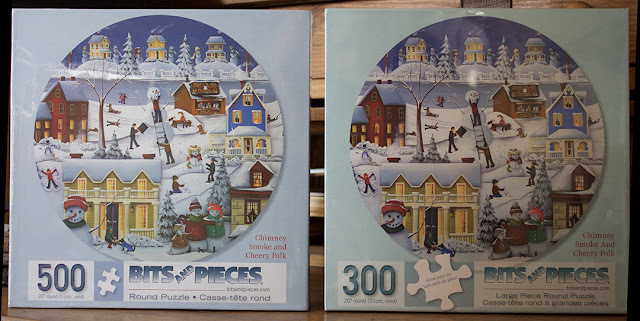 One lucky person will get the 500 piece puzzle and the other will get the 300 piece puzzle. To be eligible for the drawing just leave a comment on my blog and I will be drawing the name on Sunday evening January10th. Due to the cost of shipping overseas this "giveaway" is only available in the US and Canada. Please put your name in your comment along with your email address if you are commenting anonymously so I can contact the winner. This was a little difficult to photograph because of the plastic shrink wrap. They are sold at Bits and Pieces. The puzzle is 20" in diameter. I know I'm a little crazy, but I absolutely love snow! 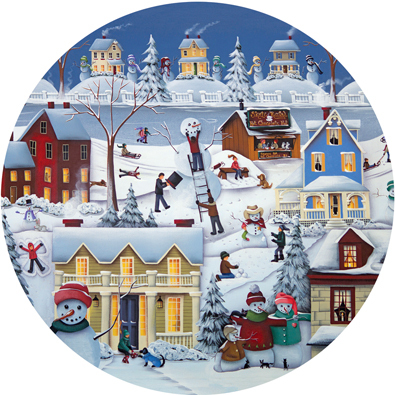 What is your opinion of winter or do you live where it's nice and warm all year long? I enjoy the winter for the first few months, but it starts to get old after several months. I live in Alberta, Canada where the winters are extra long and extra cold. I love winter! Nothing better than snuggling in with a cup of tea and handwork or a puzzle! Catherine, how pretty! What a thrill to see your work made into a puzzle. It sure looks like a beauty! We used to set up a puzzle table for the winter right where the tree stood. Such fond memories of that. Do I love winter? Not so much. It is my least favorite season, but there is a certain thrill in the first snowstorm. It just fades fast. Ha! I love these Catherine, I love snow too and we haven't had any here in PA this year so far. Been like spring instead of winter. Daffodils have poked their noses up! How wonderful, well it couldn't happen to a a more talented person than you are. Please enter me, I'd love one. I was thinking I need to get a puzzle going in my home. Happy Happy New Year. These puzzles are adorable! I am a 'yankee' living in the south and while I don't miss driving in it, nor shoveling it at 6 AM, I do miss the beauty of snow! Please enter me, I'd love the chance to win either one. Love reading your blog and love your art work. Happy New Year. Being a 'displaced yankee' now living in the warm regions for 30+ years, I miss the beauty of snow. Would love the chance to win one of your puzzles.